Providing you the best range of high speed disperser with effective & timely delivery. 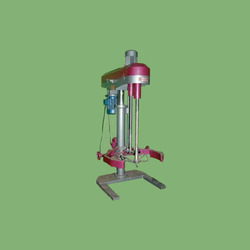 Our vast experience in the domain of manufacturing, supplying, and exporting a wide array of High Speed Dispersers has enabled us to offer High Speed Disperser for superior efficacy and hassle free performance. These are developed for various applications in food, pharma, ink, construction, and many other industries with hygienic design and sturdy construction for durability. These custom built dispersers have wear resistant plates as well as jacketed construction and can be operated under vacuum. Looking for High Speed Disperser ?